Encontré 97 Hoteles en . Seleccione la fecha de llegada y fechas de salida para ver los hoteles disponibles en . Sin informar las fechas, los precios con (*) son los precios medios de cada hotel y alrededor de una distancia de 30 km. All units are air conditioned and feature a seating and dining area. All units include a kitchenette fitted with a microwave and fridge. Towels are featured. The nearest airport is Cadjehoun Airport, 13 km from the property. Featuring free WiFi throughout the property, Comfort zone is located in Cotonou, 4.4 km from UNDP Office. Free private parking is available on site. Each room has a flat-screen TV. The homestay also offers car hire. Congo Embassy is 6 km from Comfort Zone, while Angola Embassy is 6 km away. Cadjehoun Airport is 7 km from the property. Offering a sun terrace and fitness centre, Bénin Hôtel Terminus is situated in Cotonou, 3.1 km from UNDP Office. Guests can enjoy the on-site bar. Free WiFi is available throughout the property and free private parking is available on site. Certain units feature a seating area where you can relax. A terrace or balcony are featured in certain rooms. Each room includes a private bathroom. A flat-screen TV is featured. Car hire is available at this hotel and the area is popular for fishing. Angola Embassy is 5 km from Bénin Hôtel Terminus, while DRC Embassy is 5 km away. The nearest airport is Cadjehoun Airport, 6 km from the property. Featuring free WiFi and a sun terrace, Majorelle Cotonou offers pet-friendly accommodation in Cotonou. Free private parking is available on site. The rooms come with a TV. You will find babysitting service at the property. The guest house also offers free use of bicycles, bike hire, and car hire. Set in Cotonou, 3.8 km from UNDP Office, Green Horse Hotel features free WiFi access and free private parking. Guests can enjoy the on-site bar. Certain units feature views of the pool or city. A flat-screen TV is provided. There is a 24-hour front desk, a shared lounge, a business centre and gift shop at the property. Congo Embassy is 5 km from Green Horse Hotel, while Angola Embassy is 6 km from the property. Cadjehoun Airport is 7 km away. Offering a year-round outdoor pool, Urban Suites Cotonou is set in Cotonou. UNDP Office is 2.8 km away. Free WiFi is featured throughout the property. The accommodation is air conditioned and comes with a satellite flat-screen TV. Some units feature a seating area and/or balcony. There is also a kitchen, equipped with a microwave, fridge and stovetop. Every unit has a private bathroom with free toiletries. Free private parking is available at the aparthotel. Urban Suites Cotonou also includes a fitness centre. Guests can enjoy a drink at the on-site bar. The property also offers grocery delivery. DRC Embassy is 4.2 km from Urban Suites Cotonou, while Angola Embassy is 4.2 km from the property. The nearest airport is Cadjehoun Airport, 5 km from the property. Featuring free WiFi throughout the property, Bresilia Hôtel offers accommodation in Cotonou. Guests can enjoy the on-site restaurant. Free private parking is available on site. Rooms come with a flat-screen TV with satellite channels. Congo Embassy is 4.3 km from Bresilia Hôtel, while UNDP Office is 5 km from the property. The nearest airport is Cadjehoun Airport, 8 km from Bresilia Hôtel. Featuring free WiFi and air conditioning, Residence Tabisco is situated in Cotonou, 3 km from UNDP Office. Angola Embassy is 4.1 km from the property. Free private parking is available on site. All units include a flat-screen TV with satellite channels. There is also a kitchen, equipped with an oven and microwave. Towels are featured. DRC Embassy is 4.2 km from Residence Tabisco, while Super U Market is 5 km away. The nearest airport is Cadjehoun Airport, 5 km from Residence Tabisco. 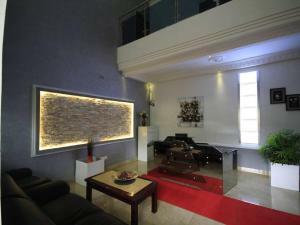 Beautiful Gate Residence & Suite offers pet-friendly accommodation in Cotonou. Guests can enjoy the on-site bar. Every room is equipped with a flat-screen TV. Some rooms feature a seating area for your convenience. Beautiful Gate Residence & Suite features free WiFi throughout the property. Car hire is available at this hotel and the area is popular for snorkelling. Congo Embassy is 5 km from Beautiful Gate Residence & Suite, while UNDP Office is 6 km away. The nearest airport is Cadjehoun Airport, 9 km from Beautiful Gate Residence & Suite. El Mediterraneen Hotel está situado en Cotonú y dispone de conexión WiFi gratuita, restaurante y terraza. Además, ofrece aparcamiento privado gratuito. Algunas habitaciones tienen zona de estar y todas cuentan con TV de pantalla plana y baño privado con artículos de aseo gratuitos y secador de pelo. Hay servicio de traslado gratuito y peluquería.